Gaming is a very immersive experience. You need the best quality sound equipment to truly lose yourself in the virtual world. Most gamers prefer using headsets for maximum focus and immersion. 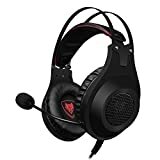 Whether you are into consoles or PCs, there are numerous gaming headsets out there for you. Now, we all know how expensive the top end of the gaming hardware market can be. But when it comes to accessories like headsets, that is not really applicable. 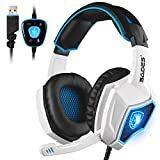 You can find some amazing deals on the best budget gaming headset brands online these days. Find the best budget gaming headset for you in our review! This is a wired gaming headset from the well-known brand Sades. The device is compatible only with PCs, laptops, and desktops. The 7.1 surround sound feature helps deliver the highest level of realism and immersion. The noise cancellation feature is also quite effective, and it does a good job of preventing unwanted external sounds from spoiling the experience. The headsets are available in black and white colors, with blue and red trim options, respectively. Bright and dynamic LEDs enhance the looks of the Sades Spirit Wolf. The mic also offers excellent performance, with minimal cracking and static. Overall, the headset sits very comfortably on your ears. The Sades headset is available at steeply reduced prices now and then. The EG3 is a cheap and affordable headset from Mpow aimed at console and PC gamers alike. This is a wired headset. Console support is limited to PS4, though. And yes, this headset does support 7.1 surround sound for maximum audio quality. If you download the Mpow software, you can even create customized audio profiles (on PC). foam earpads feel very comfy on your head. They also do a good job at noise cancellation. The mic on this headset is flexible and can be pointed in any direction. It is very sensitive and will capture any sound you make. 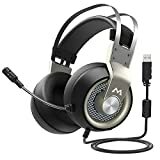 The headset is made from lightweight metal and plastic, and it has a black and silver look. It lacks any flashy LEDs. The HS50 from gaming behemoth Corsair is available in a wide range of configurations. You can buy it with a 3.5mm jack, or purchase the 3.5mm + USB combo version that is compatible with consoles. There is even a wireless 7.1 surround sound version. On the basic 3.5mm we tested, the neodymium speakers deliver excellent stereo quality sound. The mic is unidirectional and can be detached for use on the go. It also reduces ambient noise to deliver maximum audio quality. The metal build quality is the best feature of this budget headset from Corsair. Though it lacks any flashy LEDs, there is an option to buy a stand with flashing LEDs along with the headset. The Cloud II is among the more expensive units on our list of best budget gaming headset brands. 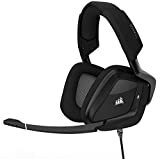 This is a wired headset that is compatible with PCs as well as Sony and Microsoft consoles. The combination of neodymium drives and 7.1 surround deliver outstanding sound quality and immersion during gaming. Memory foam pads and extra velour pads offer excellent comfort for your ears. The removable mic is certified TeamSpeak compatible, for the best multiplayer experience. The device has a durable metallic construction. You can get this headset in black, with two trim options: red and gunmetal grey. It lacks any LED lights. 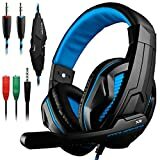 This is among the most affordable budget gaming headsets out there. You can use it on your PC, laptop, smartphone, and PS4. As a low-end product, you cannot get 7.1 surround here, just basic stereo. The quality is quite decent, though, considering the asking price. The mic is omnidirectional but has a rigid plastic frame. Its performance is quite acceptable. The ear cups have PU leather and memory foam for excellent comfort levels. This headset is made entirely of plastic. It is only available in black, with blue trim. It does not have any LEDs. The N2 is yet another low-end budget option for gamers. It is compatible with PCs, as well as both XBox and PS4 consoles. The large, wired headset has 50mm drivers for loud and clear sound output. At this price point, stereo sound is all you can expect. The mic is strictly adequate for multiplayer gaming sessions. Noise cancellation is quite decent, thanks to the memory foam padding. Comfort levels are also quite high, since this is a lightweight plastic headset. The volume controls are located along the earcups for easy accessibility. The headset is only available in black, with red trim. Razer accessories are known for their top of the line performance, and the Kraken wired headset lives up to that reputation. It is mainly designed to work with PC and PS4 (it has a USB connector). The sound quality is one the best out there, which is not surprising as this has 7.1 surround. The 50mm drivers offer excellent sound quality. You can customize the output using Razer Synapse software on PC. The headset is made from lightweight aluminum and plastic, and is very light indeed. The padded ear cups cover your ears for superb noise cancellation. These black Kraken headsets come with the proprietary Chroma lighting system. You can customize the colors to your heart’s content. This Razer headset is often available at a discount, which is why it finds a place on our list of best budget gaming headset brands. 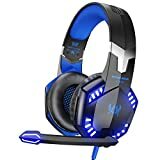 This is a bright and colorful budget gaming headset from VersionTech. It is wired, and compatible with all consoles and PCs. The audio quality is decent, thanks to the 50mm neodymium drivers. The mic performance is also perfect for long and hectic multiplayer FPS battles. The headset is designed for maximum comfort. It has PU leather cushions and a retractable headband for long gaming sessions. And yes, you do get bright LEDs to set the mood with this VersionTech gaming headset! The Arctis 3 is a feature-packed gaming headset available at a not too steep price. This wired headset is compatible with all major gaming platforms. The S1 stereo speaker drivers deliver a very balanced sound output, which works well for gaming as well as movies and music. 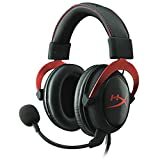 This is the best budget gaming headset for people looking for a very versatile option. The mic comes with a SteelSeries ClearCast technology for maximum clarity. This is one of the most comfortable headsets out there, with athlete inspired cushions and headbands. The Artcis 3 is available in black, grey, red, blue, and white. LED lighting is, sadly, not featured here. The Void Pro is a high-quality wired gaming headset from Corsair. This is a PC gaming headset, but you can probably get the USB to work on a PS4 as well. The sound quality and mic performance are both top-notch, among the best you can expect in the budget segment. Yes, you also get Dolby 7.1 surround sound, and it is phenomenal! The mic is Discord certified for top-end performance in online multiplayer gaming. The slim, minimalist design looks cool, and also means that this is a light headset that does not weigh heavily on your head. Microfiber fabric and memory foam have been liberally used to enhance on-ear comfort. Programmable LED lighting has always been a strength of Corsair accessories. This product also gets the famous RGB lighting system. You might be able to snag the best budget gaming headset on this list on a discount deal, if you are lucky. There is a wide variation in the budget gaming headset market. You can find products compatible with all major platforms here. LED lighting and 7.1 surround are not available on all products, though. However, the best budget gaming headset has to score high in terms of comfort. Wireless sets are quite rare at this level. Have you found the best budget gaming headset for you on our list? Tell us in the comments.